The 7 Best Wings in Arkansas! As far as favorite foods go, wings rank near the top in Arkansas. From the classic spicy Buffalo style to a mouthwatering garlic honey barbecue, you’ll find your flavor here. But if you’re having trouble finding the best place to get them, then we’re here to help. Check out the best wing places in Arkansas! This award-winning Arkansas original has been in the wing business since 2004. With 50 awesome sauces to choose from, like the very popular Acid Rain, Foghorn’s has a little something for everyone. Foghorn’s is your place for wings, beer, and sports! This great spot began on “a wing and a prayer” across from Dover Air Force Base, Delaware, back in the summer of 1985. Today there are more than 80 stores spanning coast to coast and with 19 different mouth-watering sauce flavors, Wings to Go has the right wing for you! This chicken joint is a Little Rock favorite. Specializing in buffalo-style wings, Wing Shack has 12 mouth-watering wing sauces to choose from. Your hardest decision here will be picking between the garlic honey barbecue and suicide flavors. Zaxby’s was born on a basketball court in Georgia in 1990 and the rest, as they say, is chicken history. Home of indescribably good chicken, Zaxby’s now operates more than 670 locations in 16 states. Guest favorites include Chicken Fingerz and Buffalo wings. Folks not only keep coming back to this spot for the wings, but also for the fantastic fries! Wing Stop is home of the wing experts where you can get delicious wings, sauced and tossed in your favorite flavors, for just 60 cents per wing. 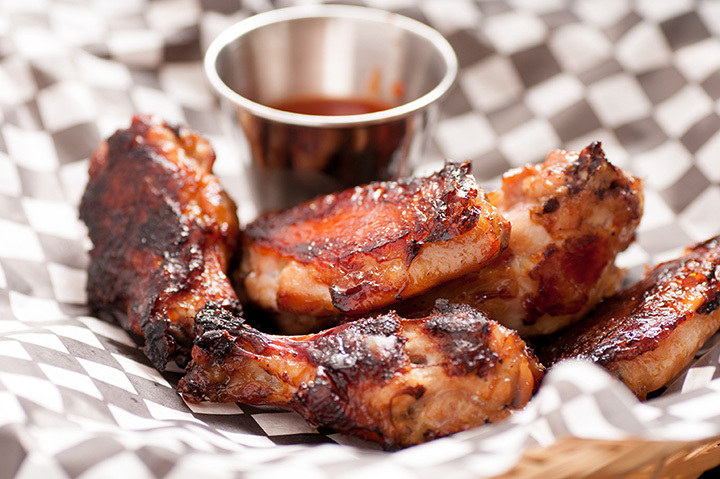 You’ll love the award-winning wings at Lucky Luke’s! They keep it simple, letting diners choose between hot or mild barbecue, Buffalo, or naked flavors. So, come on it and Get Lucky at Luke’s! Hooter’s often gets a bad rap but one thing is true: they have good wings! Let your taste buds guide you as you choose between Hooter’s world-famous wing selection: original style, naked, Daytona Beach style, boneless, or bacon-wrapped.